Please note: this blog is now available at www.quiltingfortherestofus.com. You can also subscribe to the new blog by email if you'd like--you'll see the link for that on the side of the new blog page as well. The podcast is still available at the same feed as it always has been, but the show notes for each episode have been moved to the new site. However, www.quiltingfortherestofus.com will get you there as it always has. If, for some reason, you use that link and still see my old Podbean site (which you shouldn't, but just in case), you may need to clear your cache and try again. But I think we've got everything all copacetic now. I have disabled comments on this blog and will no longer be posting here. Please join me at the new site instead--it's much prettier! And you'll want to do so right now--I'm about to start some super-exciting giveaways in celebration of my Third Podcastaversary! ...as soon as the domain redirect happens, in any case. Which could be any time in the next 24-48 hours. I am moving my blog and podcast show notes all under one roof. This is a change I've been wanting to make for some time, but never had the time to put it all together. However, some changes on one of my hosts ticked me off and made it too difficult for y'all to be part of the conversation. So I finally enacted something I've been poking away at for awhile. If you subscribe to my podcast through iTunes, no fears. Nothing has changed there. There's a page for my blog. There's a separate page for all the show notes to my podcast episodes, plus you'll be able to stream or download episodes from that page too. Each of those pages has a separate RSS feed, available through a link on the sidebar, so you can subscribe to either of them however you want. You can subscribe to my blog through Feedly or Bloglovin' or whatever your what-you're-using-now-that-GR-is-no-more-of-choice is. You can use your favorite podcatcher to subscribe to the podcast, if you don't get it through iTunes. The most important thing to me? You'll be able to leave comments on the show notes to my podcast without having to bow down to the Evil Overlord of Facebook. Okay, so I use Facebook. I don't mind Facebook. I absolutely detest being forced to use Facebook as my commenting system on my podcast and I detest having listeners not be able to leave comments unless they have a Facebook account. But let me not get venting again. I'm excited about the new site. It's pretty. It has some very nice features for me from an admin point of view. I hope it's easy and attractive for you to navigate from a user point of view. I'm still poking away at some things--it probably won't be fully set up by the time you're first able to visit it. But I hope you'll visit. And I hope you'll help me test it out by leaving all sorts of comments! I'll post here again when the redirect has happened and I'll leave RSS feeds here and such too. Eventually I'll take the time (when I have it again) to actually post a redirect here. So this is just your heads-up. Keep posted! Finally--I've had the time to sit down and finish my 30 questions! Two people, but that's mostly because they worked as a pair: Susan B. Anthony and Elizabeth Cady Stanton. I wanted to name my daughter Cady Elizabeth, but my husband wouldn't go for it. That's okay--I nixed his Benjamin Franklin for our son. We found happy compromises for both. In any case, I love the history of the women's suffragette movement and, in fact, it's very close to home since Susan B lived in my hometown and we're the site of the Susan B. Anthony House museum. More recently, however, I've become more aware of how the two women worked together as a team. Although Susan B is the most well-known, she wouldn't have accomplished what she did without Elizabeth as a partner. And Elizabeth was a very impressive person in her own right. If you're interested in a fun way to learn more about them, by the way, the History Chicks podcast recently did an episode on Elizabeth Cady Stanton that was a great look into her life and talked at some length about her relationship with Susan B. Very cool stuff. What would I eat? I'd probably cook for them because I'd want to just be able to listen to them chat with each other. But from what I've read, I also expect they'd shove me out of the kitchen and want to pitch in. So maybe we'd have to compromise and do a stew in the slow-cooker or order take-out so we could all just hang out and talk. That it's okay to be rude. That being mean is funny. That we're past racism, sexism, whatever-ism, and it's okay to say those things because "I don't really mean it, you know." That people who have a different opinion than us are completely wrong and should be shouted down and called names. Yes, I freely admit it: I am one of those people who longs for a return to civility. My brain. I love how much I love to learn; I love playing with ideas; I love those brief moments when I actually feel smart. And no, this isn't a cop-out. Sure, I have the same body-image issues most women of a certain age and size have. But I also think we tend to forget that our brain is a body part and worthy of respect and love! I actually had to look this one up because I wasn't clear what was meant by "love language." I took the quiz on www.5lovelanguages.com and apparently my love language is evenly split between Quality Time, Acts of Service, and Physical Touch (although that last one is really only true for my intimates--my husband and kids. Everyone else, keep your distance!). I think I covered this in an earlier post. People think I'm much more complex than I really am. I'm really pretty WYSIWYG. I'm not permanently ticked off--my face just tends to look that way. I generally like people even though they think I'm being aloof. Yes, I like to keep my thoughts to myself, but that doesn't mean I'm shy or afraid or anything. Just private. Does that cover it? I hope my kids always remember this momism I tried to use through their growing up years: "You can't control what others do; you can only control how you react to it." I try to live by that myself. I'd like to be remembered by someone as a person who encouraged them to be more than they thought they were capable of. I hope to be remembered by many someones that way, but one would be good enough. I'd like to be remembered for my writing. 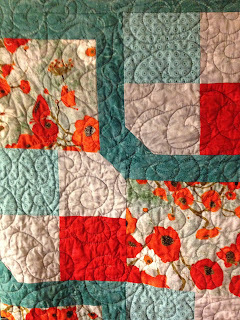 I might like to be remembered for my quilting--but really, only by my family and close friends. 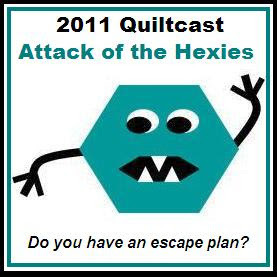 I have no dreams of winning big quilt shows or writing quilt books or becoming any sort of quilting celebrity. 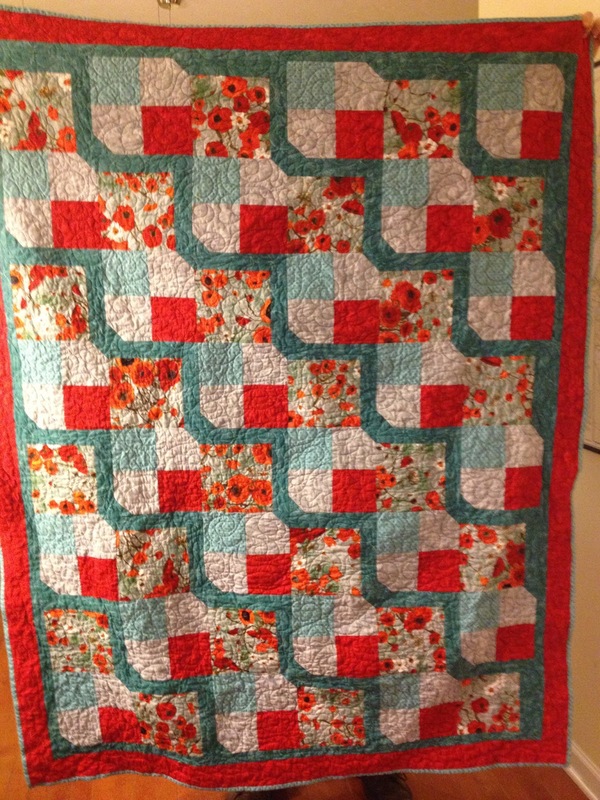 It's something I love doing for myself and simply hope that it helps my family remember me when I'm gone, like I still have my Mom's quilts surrounding me. I'd like to think people will remember having a few good laughs with me. I hope to be remembered as a wonderful grandma--although that would take having some grandkids, which is likely a ways off. Or granddogs. Whatever my kids choose to give me. I'd love to be remembered for playing some small part in raising awareness about justice issues and maybe changing a few minds along the way. I hope to be remembered as a deeply connected person--connected spiritually, connected to my family and friends, connected to life. Sure, I'd like to be remembered as a great cook. Why not? That would be fun. I absolutely would like to be remembered as a wonderful wife and a great mom. First, foremost, and beyond all the previous 9 items. Hey--I think that's it! I've finished my 30 questions! What about you? 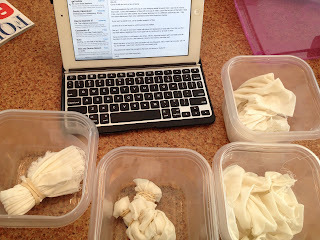 Are you reading this through Google Reader? Google just announced it's plans to shut down Google Reader in July. I'm not panicking. That's plenty of time and, given the backlash, they may have been surprised by the number of people actually using Reader and may extend it. Still, it's a good time to explore how you follow blogs and perhaps make some changes. I've been doing some research for my own use, so I thought I'd pass along some links to articles for you for now--these may help you check out some alternatives. Everyone has different needs and likes/dislikes so what works beautifully for someone else may not work for you. For example, when I first got my iPad, a friend told me I should use FlipBook because she just adored it, best thing since sliced bread, etc. I didn't like it at all. That doesn't mean she's wrong, just means we have different needs and tastes. So, test them out, play around a bit, see which one you like best. These are simply the articles I've come across today--more will be written in the future so keep checking the web. It does seem like Feedly is coming out strong in terms of top recommendation, but as I'm writing this on vacation I can't test anything out until I'm home this weekend. 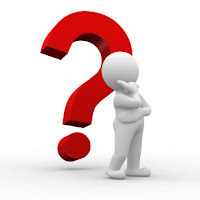 By the way, as Google continues to tighten it's offerings-belt, I had already started the process of moving this blog from Blogger to Wordpress. Blogger has begun to annoy me, for one, but I'm seeing the writing on the wall. I'll give y'all fair warning when it happens so we can make sure we don't lose any of you! Meanwhile, have fun looking at your other Reader possibilities. Find what works for you. 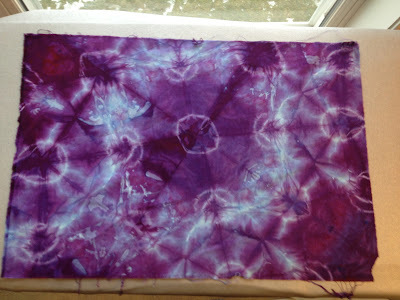 These were the fabrics created in my snow-dyeing experiments a couple of days ago. 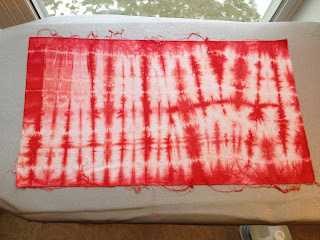 Yesterday I had the day off and since dyeing is a fairly restful activity for a sick day (still coughing! 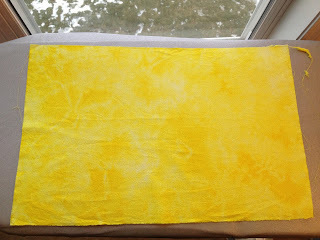 ), I decided to review Jane Dunnewold's "The Art of Cloth Dyeing" class in Craftsy that I'd purchased and watched some months ago. 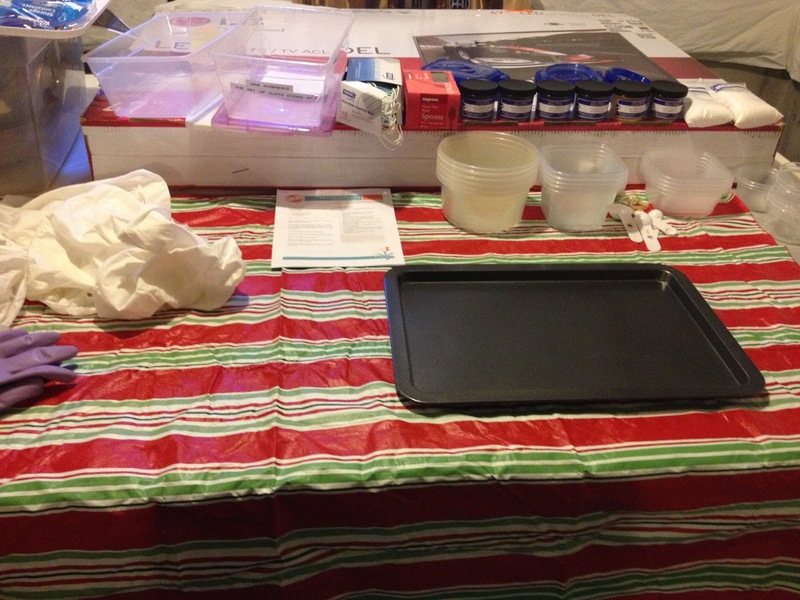 I'd bought the kit of supplies from Craftsy, figuring that it was simpler and just about as cost-effective to buy the kit Jane had put together with the basic supplies needed than it would be for me to chase all over the Internet finding and ordering them. I felt a bit like a mad scientist in my basement, with rubber gloves and mask on, hunched over a table mixing chemicals. It was a hoot. I started out well organized. Look how neat and clean everything is. Soon enough there were drips and puddles and bins of things in wonderful, hopeful color baths. This one was straight turquoise. 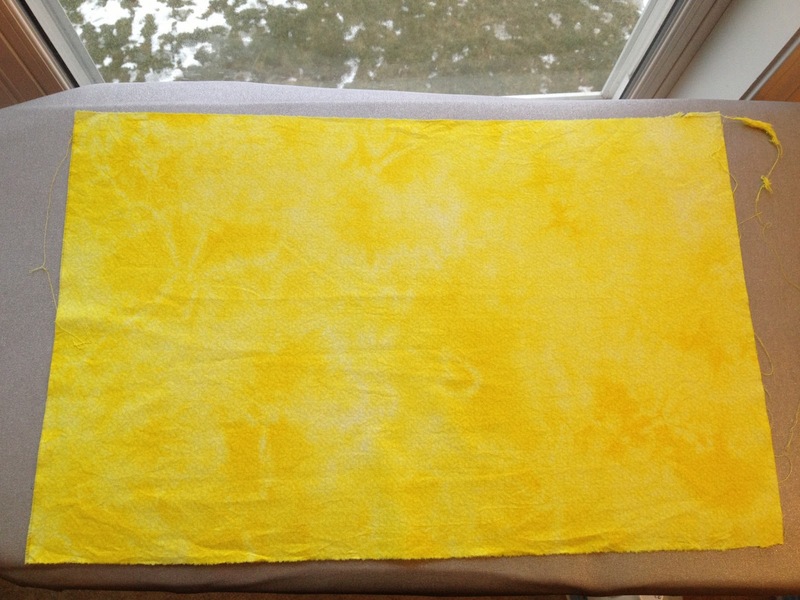 This is roughly the same mix of turquoise and yellow that I did with the snow-dyeing above. The colors are so much more brilliant! I was shooting for teal on this one, using less yellow proportionately to the turquoise, but I ended up with this wonderful abstract art instead. Love it. This is a white tone-on-tone that I had in my stash and sacrificed to the Cause of Experimentation. In this picture, the side showing is the white tone-on-tone side. 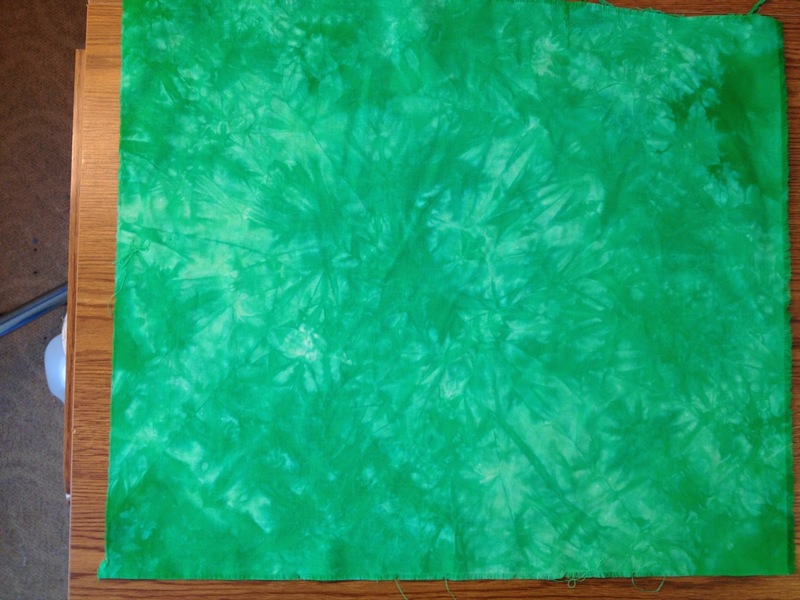 The white print acts as a resist for the most part--it's only dyed the lightest green but mostly stayed white. I wasn't too fond of this side. But the reverse? Here's the wrong side of the above fabric. Very, very nice. It was a fairly dense print on the fabric to start. 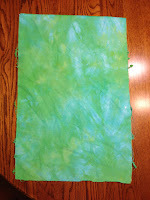 It would have been more interesting if there were less of the print to resist and more of the background to get dyed. This was in a mix that was more turquoise than yellow. 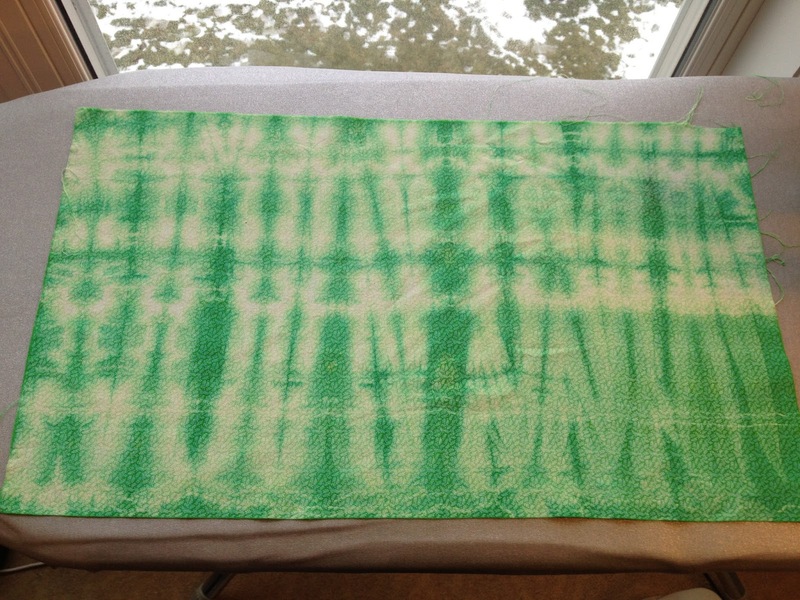 I was hoping for a teal, but instead I got this really funky mottled effect. Love! Yummy red. Straight-up red, not mixed with anything. Another section of that white tone-on-tone. I was shooting for orange here. Almost got it. I have to play more with my color recipes. The mottling comes out better in this picture than in real life. It mostly just looks like yellow fabric. And the wrong side of the fabric. Although in this case, I'd use this as the right side. Hmm. Looks pretty intense here. 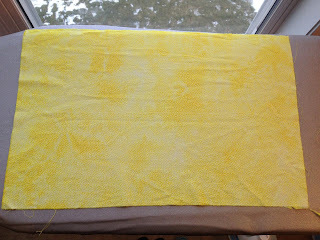 It's not that bright--just a nice, springy, lemon yellow. I mixed turquoise and red for purple, folded the fabric in a triangle and used a couple of rubber bands on two of the ends. Unfortunately, I've run out of dyeable fabric--at least, what I'm willing to sacrifice from my stash for the time being, so I've got some PFD (prepared for dye) fabric on order now from Dharma Trading Company. You don't have to have PFD, by the way. I'm just testing various things to see what I like best. Some of the above fabric was Kona PFD fabric I'd picked up at Joann's awhile back. 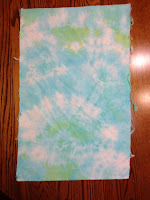 Some was white/off-white quilter's cotton I'd gotten in the scrap box from Fat Quarter Shop, and some was the aforementioned tone-on-tone. 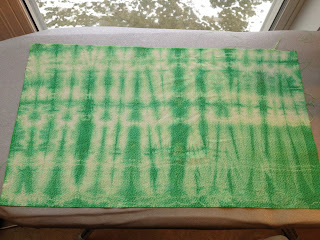 I washed the scraps and tone-in-tone with Synthrapol to prep it for dyeing. It all took the dye beautifully. 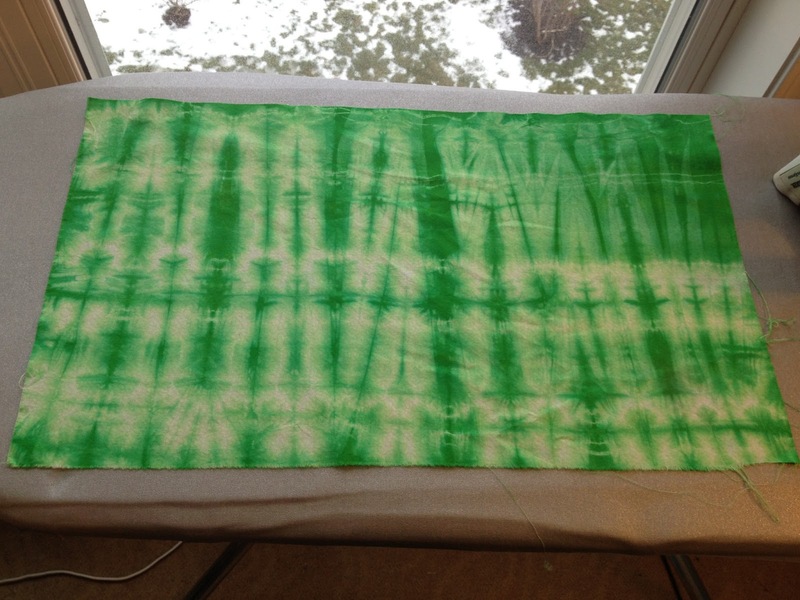 I was going to title this post "Sick and Dyeing," but thought that might send a bit too much panic. Adding some elipses may at least give people pause before they assume the worst. Although, a few days ago, it was arguable just how lively I really was. Doing ever-so-much-slightly-better now, thank you for asking. Still not quite up to a podcast. Hopefully sometime later this week. 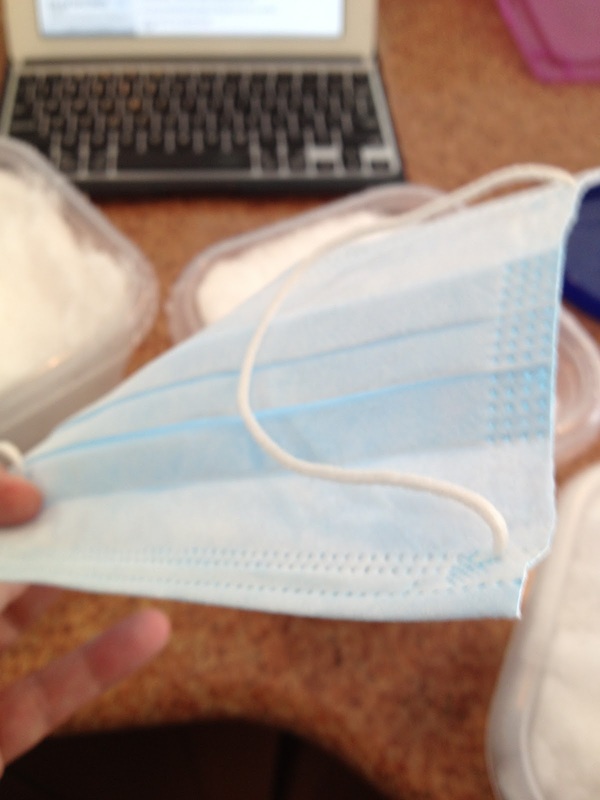 Yes, almost two weeks ago I came down with the same cold/flu thing that's been making the circuit. For some significant percentage of the afflicted, it has gone into pneumonia. When I finally gave in and called my doctor to ask if she could prescribe me anything that would help the cough go away long enough for me to get a decent night's sleep, she required me to actually come in to see her. I wasn't aware of the pneumonia thing. Fortunately, not pneumonia in my case; she prescribed an inhaler which helped remarkably during the day and antibiotics. Nights are still rough. I'm allergic to codeine so the usual 'Tussin with Codeine thing didn't go well (the headaches it gives me are worse than the slight relief from the coughing). I'm back to Nyquil Cough and I'm glad to say, last night was the first uninterrupted night's sleep I've gotten since this nonsense began 12 days ago. I was supposed to be driving for 6+ hours today for work but gave in and called my supervisor last night. When I couldn't even make it through the conversation without coughing fits, she very kindly moved our staff meetings so now I don't have to go down for another couple of weeks. I feel like two or three more days of quiet should kick this thing for good. Meanwhile, what to do on sick days? I hate being completely non-productive, but I had to take things v-e-r-y slow with lots of long breaks. I did manage to get some things accomplished, though. 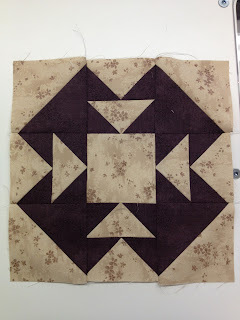 Our Guild does Blocks of the Month most years, in which one of our guild members (Kate) chooses a block from a book and we all make it in whatever size/colors we want. No swapping--just making it for ourselves. 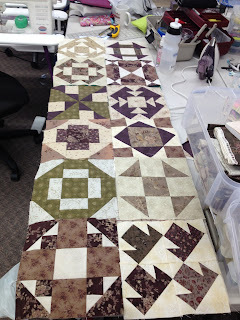 (This year we're doing it with paper-pieced blocks that I've posted about before.) I'd started doing the BOM in 2008 and never finished, so I pulled out that bin this weekend. I was pleased to see I was only three blocks short. After I got this block done, I realized I'd used almost exactly that same combination of fabrics in a previous block I'd made five years ago. Oops. Oh well--shows that the combination has staying power, I guess. 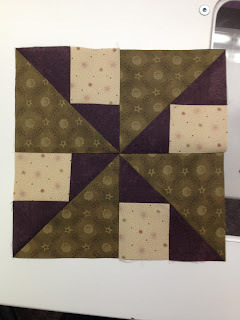 I kept this one simple to balance out a few of the other busier blocks. This was the last block, so I put all previous 11 out on the table to see what fabrics I needed to use to pull them all together. I had a rather troublesome almost-entirely-green block, and another troublesome strangely-pinkish block that I wanted to make seem more like they fit in with the rest of the collection. 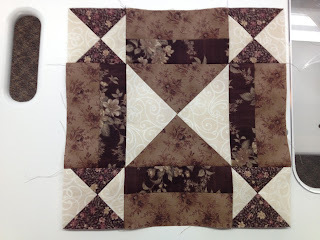 So I used one fabric from each of those blocks, and the third is a fabric I used often (note it in the block above). 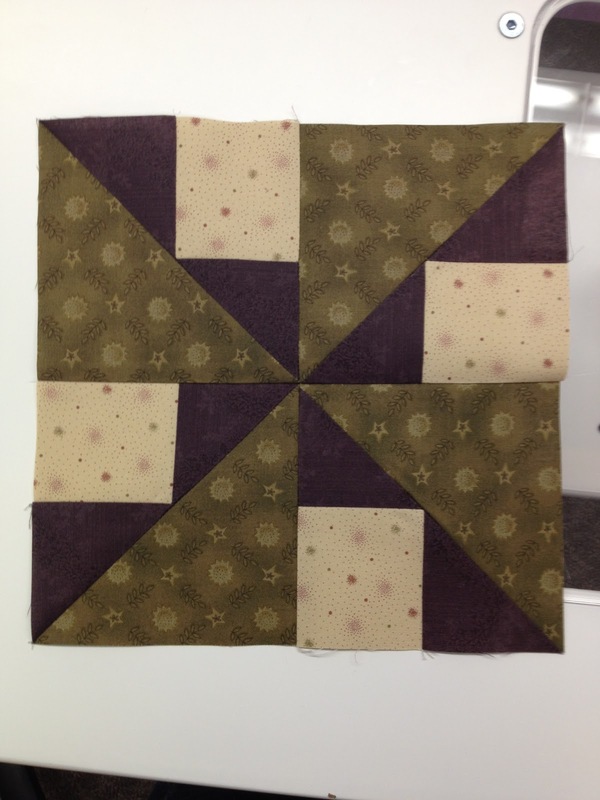 With this one "tie it all together" block, I made the two troublesome blocks no longer troublesome. Now everything feels like it fits. Dang, sometimes I actually know what I'm doing. So here are the 12 blocks together for the first time ever. You can see the originally-troublesome green block near the front of the picture; the strangely pink one is sitting right above it, although it doesn't come across as much pink in this picture. That's the problem with taupes. When you're buying them individually, they all read "taupe." When you put them next to each other, you realize you've got a pretty wide range of colors. Those blocks are now hanging on my design wall while I decide what I'm doing next. I'm pretty sure I've decided sashing, and I'm pretty sure I know which fabric I'm using for it. 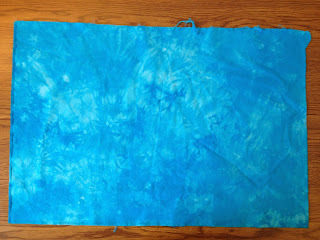 I have a border fabric already that I know will work. It won't take me that long to get the top pieced--just have to get myself to the energy level where I trust myself to do math. 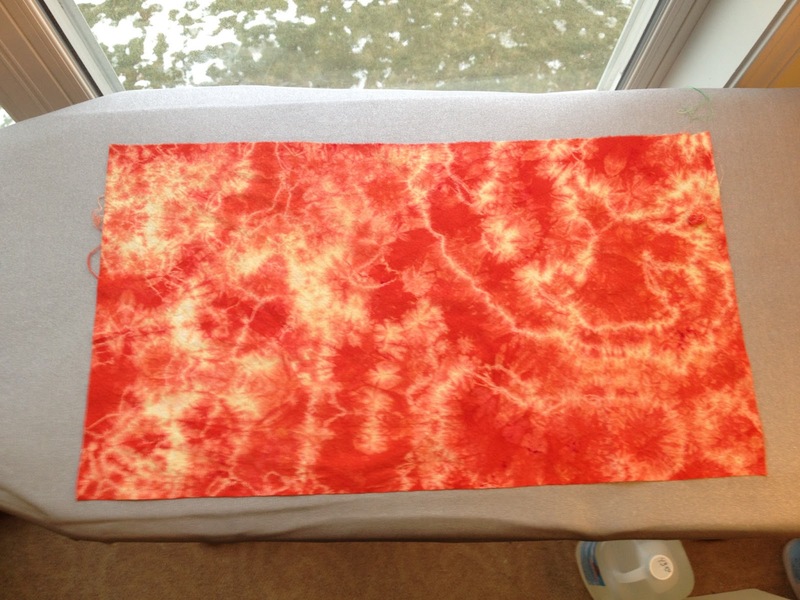 I also got a couple more steps done in the Kimberly Einmo "Chain of Stars" mystery quilt on Craftsy, but I'm not allowed to post pictures of that publicly yet. She doesn't want us ruining the surprise for anyone else. I hope she lifts that stricture soon, though--I hope to have it done in another few weeks and don't want to wait too long to post it as a finish. 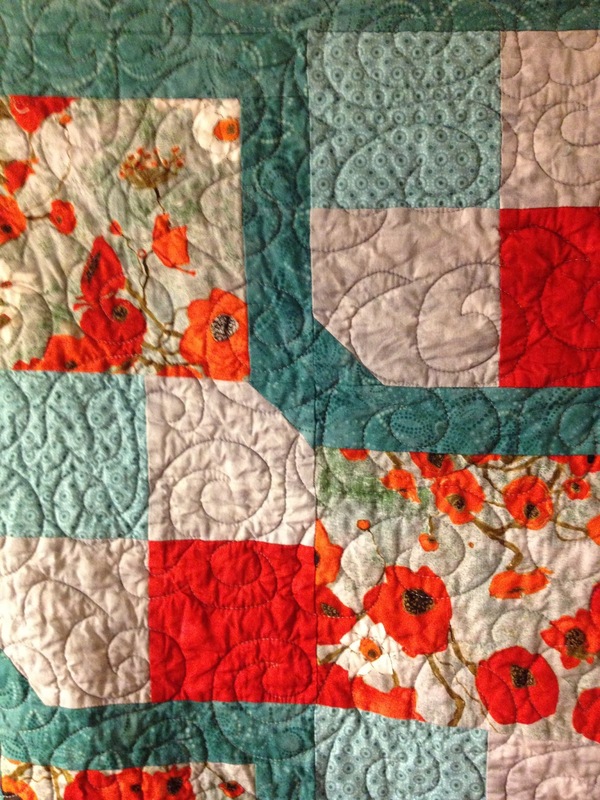 Thirdly, I got my Poppies quilt back from the longarmer and finished putting the binding on this morning. 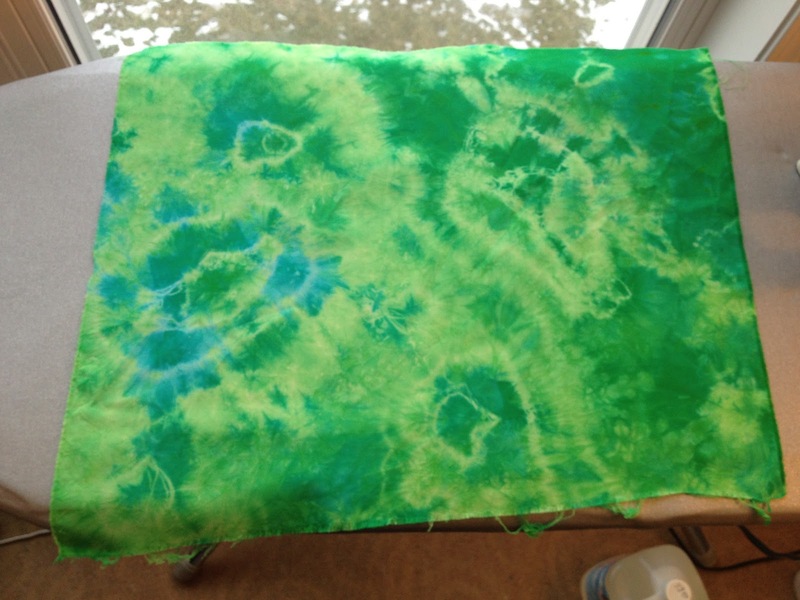 (Another great sick-day activity since it requires hours in front of the TV hand-sewing.) It's in the wash at the moment. I'll post pics later. Then, because on Sunday I woke up to several inches of new snow, I got the bug to do some snow dyeing. Dyeing is a fantastic sick day project. About 20 minutes of activity and then several hours of waiting; a few more minutes of activity and then waiting...It was great. I felt like crud but I could still be creative. For the win. 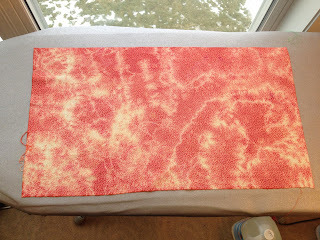 I have dyes and such because I'd bought the kit available for the Jane Dunnewold Fabric Dyeing class on Craftsy months ago and hadn't gotten the time to use it yet. I tweeted Sandi Colwell of Quilt Cabana Corner, who had recently been posting about her snow dyeing experiments, and asked if she could send me quick-like-a-bunny how she had gone about it. She immediately replied with an email of instructions. I love social networking. 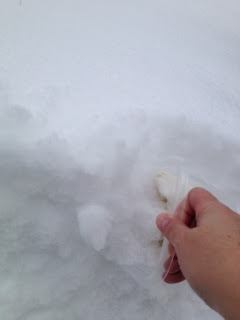 I reached out my patio door to scoop snow into the container with the fabric. Just out of sight to the left of my hand is Sam's snout. He was extremely curious as to what I was doing and I had to keep shoving him out of the way. Doofus. 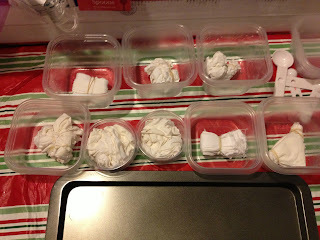 Here are all my containers ready to go. Must have the face mask before opening the powdered dyes. Probably should've been wearing one of these on the plane back from Phoenix--maybe I wouldn't have gotten the plague. Go figure. 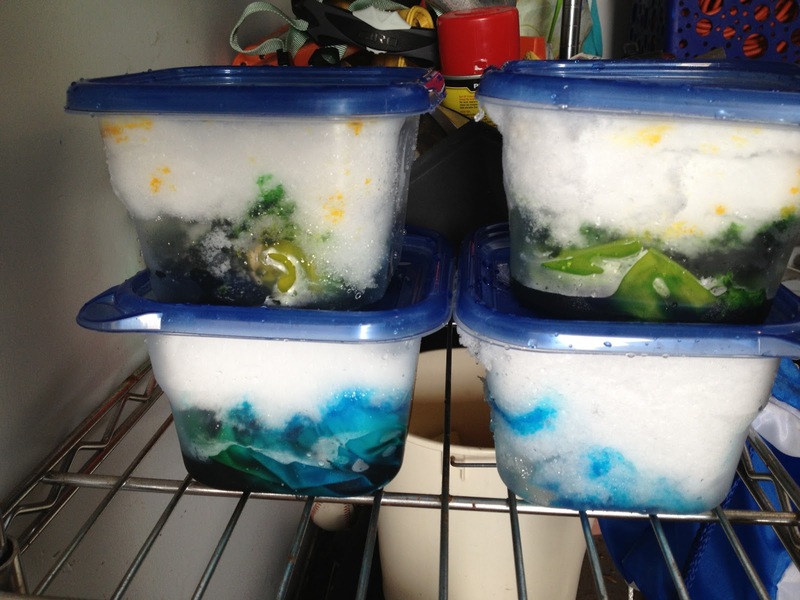 As soon as I poured the dye solution onto the snow, it melted. Oops. In my usual "How fast can I fix this?" 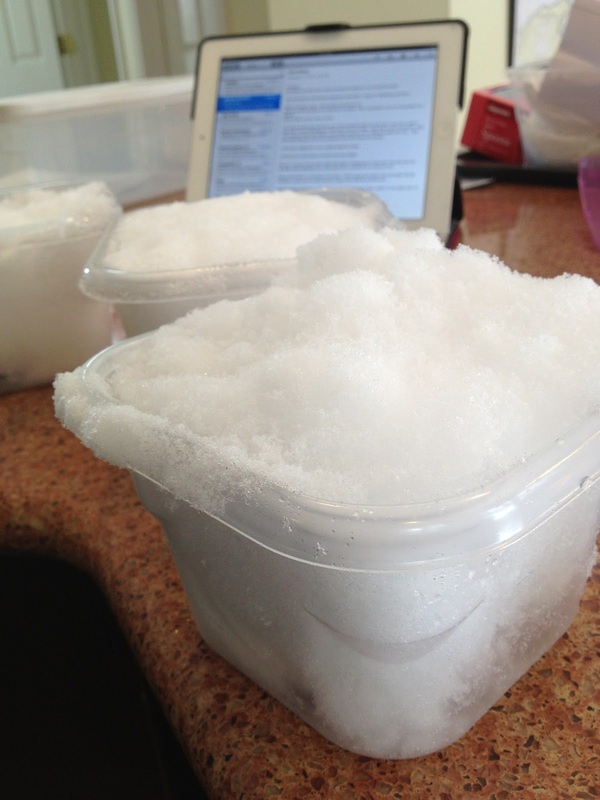 mode I just scooped a bunch more snow into the container, figuring it really had more to do with the water and cold temperatures or something. I wasn't exactly thinking straight. 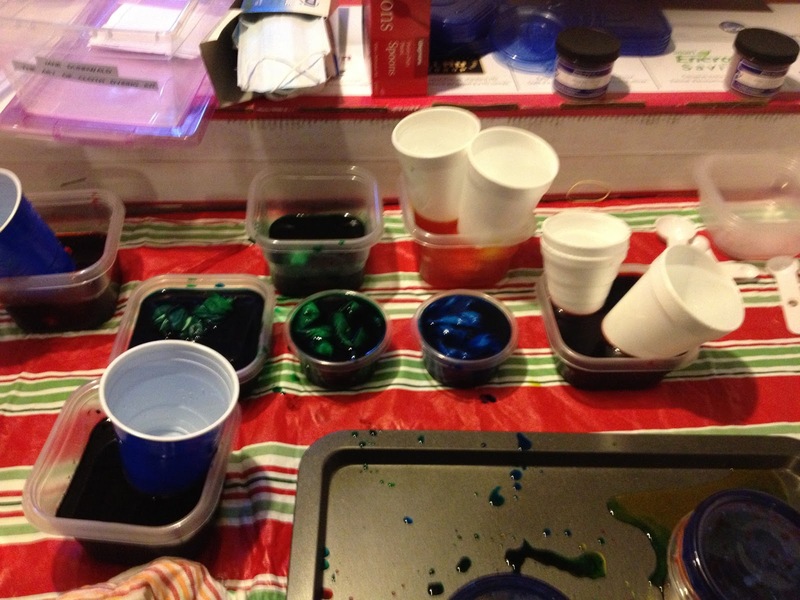 I think all I did was dilute the dye. I've since read information about people sprinkling the dye powder directly onto the snow rather than making it a solution first. That would likely work much better. 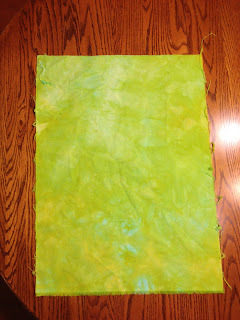 This first one was mostly yellow with some turquoise thrown in (scrunched). This was mostly turquoise with some yellow thrown in (scrunched). This is the one that I bunched up with rubber bands; it was in turquoise, and then I had a little yellow dye solution left over so I dumped it on one end of the banded fabric. 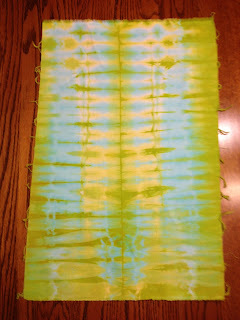 This is the accordion fold one that was in what I thought was a fairly even mixture of turquoise and yellow, but it was clearly more yellow. I have a very strong memory of sitting on my mom's lap as she was watching "The Secret Storm," her soap opera of choice. Given where we were living at the time, I could've only been maybe two or three years old. I just remember the feel of being on her lap, of feeling her breathing, and watching the opening credits of show. I mostly remember feeling her breathing, and how soft and comfortable and safe I felt. The second memory that pops to mind is not soft, comfortable, or safe! When I was turning five, we were building our new house out in the country. And I mean, literally, we were building it. My Dad and Mom had decided to do a "back to nature" thing and my Dad was determined to build as much of our house with his own two hands as possible--never mind that he wasn't a contractor nor an architect. But he'd read a lot of books about it. Given that, he actually did a remarkably good job--it kept us warm and dry for many a year, even if it was never finished. I have a lot of memories of the building of that house, but specifically I recall the pouring of the concrete in the basement floor. Dad had my older sibs helping with rakes and shovels to smooth out the concrete as it was being poured--there were planks criss-crossing the framework every which way to give everyone a dry place to stand and walk as they were doing their work. I'm sure I'd been warned many times to stay out of the way, but as five-year-olds do, I was determined to be right in the action. And, of course, I slipped off one of the planks as I was running and my foot plunked right down into the wet cement. I remember Dad grabbing me as fast as he could and carrying me in his arms as he ran up the hill to where the trailer we were living in was so that he could rinse off my foot before the concrete set. I thought of it all as a grand adventure. I'm sure my Dad remembered it quite differently! The third memory is more of a montage of scenes around a theme flashing through my mind: My Mom and my sisters and I trying to shove cows back into the pasture. Seems like that was a general past-time. We only had one cow at a time--we'd raise it for a year, then it would feed us for another year as we raised the next one. My friends used to ask if we were sad when it came time to move the cow along into the next life--and I used to respond, "No, by the time it's time has come, I'm ready to see that dang thing go!" Cows are stupid, and cows are stubborn. Or perhaps they're cleverly stubborn. Anyway, they managed to work our last nerve on a regular basis. Our fence wasn't electrified, just barbed wire. The cow would lean against it to reach the grass on the other side, eventually managing to knock it down, and then it would just casually wander out into the yard. One of us would notice it wasn't where it was supposed to be, and we'd call in the rest of the troops. Mom would haul on the halter strap and the rest of us (four girls) would lean as hard as we could into that cow's rear end--and dang if that thing wouldn't just plant its feet and refuse to budge. So many cows...so many shoving matches. Sigh. The power to shove really, really hard--and I'd go back in time and get all those dang cows back in the pasture quickly like a bunny. Probably teleportation. It would be so super-cool to just show up wherever I wanted without having to deal with flying coach. In five years, I'll be in much the same place doing much the same things. In 10 years, it's within the realm of possibility that I could be grandmothering. That would be cool. In 15 years, I'll be within a few years of retirement and hopefully making some grand plans! I know that may all sound terribly dull--don't I have ambitious goals for things to accomplish and ways my life will be wildly different? Not particularly. I like my life very much. And what I've learned in 47 years of living is that whatever I think will happen is not likely to, and what actually does happen is something I've never imagined. So I keep my eyes and ears open, but basically just enjoy the flow. Oh, this is such a gimmie. Second: Writing, although I don't do near as much of that as I'd like to and should. I spend too much time quilting, really. But when I've allowed myself the time to get deep into writing fiction, I absolutely love losing myself in a time, space, and people that only start with something in my imagination and then grow from there, surprising me with who pops up and what they do next. Third: Reading. Is that a hobby? I guess maybe someone needs to give me a really, really good definition of hobby--whenever I name something as a "hobby" I always find myself thinking, "but is that really a hobby?" Hmm. Things to ponder when I'm awake at 3 a.m., I guess. In any case, I'm a voracious reader. Even cereal boxes are fair game. Fourth: Photography, although this ebbs and flows. I enjoy doing it; sometimes I do a lot of it, then I can go through months of not picking up my camera except for utilitarian purposes. That's something I always think, "When I'm retired...." I'd like to own a digital SLR with all the lenses and filters but haven't bought one yet because I don't want to haul it around with me. So I guess that means I'm not a "real" photographer, heh heh. Fifth: Travel. Is that a hobby? But my husband and I often spend evenings tossing around ideas for places we'd like to go next. By the way, our next trip? New Orleans in March. Can't wait. When each of my sibs and I turned 12, my dad took whichever of us was the birthday kid that year on a week-long camping trip in the Adirondacks as sort of a "coming of age" thing. I didn't really question why he did it at the time--I was the youngest, so I just recall thinking, "it's MY year this year! Yipee!" It felt like it was a benchmark of some sort, even though I didn't really know what it was a benchmark of. Dad was a big fan of Thoreau, though, so I'm sure in his head it was a way of marking our coming of age by getting back to the land, connected to nature, and all that. I really enjoyed my week on the island with Dad, although (see above) there wasn't a whole lot of talking going on. Mostly reading and writing and hiking. But it was a good memory. I didn't feel like I'd grown older or learned anything particularly through the experience. I think I had more of a sense of now knowing the secret handshake that my sibs all knew--I was part of the club of "Those Who Had Camped with Dad." And I had my carved walking stick to prove it. My sisters continued the tradition with their kids--taking them on a trip to the Adirondacks when the kids were 12, and Grandpa went with them. When my son was coming up on his 12th birthday, my father had recently passed away. As Ben approached his birthday, I kept telling my husband, "you should really take him camping!" This treasured memory of mine seemed an important tradition to carry on. My husband loves camping and was willing to go for it, but my son wasn't interested. "Mom, I'm in Boy Scouts. We go camping all the time. Why would I want to go camping for my birthday?" I kept pestering him about it and he kept saying, "Why do I have to do that?" So we sat down and talked about what that camping experience actually meant, and I realized it was really about my dad trying to stay connected with each of us as we moved from childhood into adolescence and on into our teenage years. It was to mark that this was a special time. "So, Ben, what would mark this as a special time for you?" I asked. "A weekend in New York City!" he answered immediately. So that was it: His dad and he went to NYC for a weekend; took in a Rangers game, ate at restaurant that featured as much meat as you could want (a big deal for an almost 13-year-old, by the time they went on their trip), and generally had a great time being guys-about-town. For my daughter's birthday a couple of years later, she chose a spa day with me. Honestly, I'm not sure I even suggested a camping trip since I don't enjoy the camping thing as much now as I did when I was a kid. But we had a really nice day being women together, and talking about women things. I look forward to more spa days with my daughter in the future. Bonding over facials. Gotta love it. And so we change our traditions to fit the times and needs of the current generation.